Interview: Michael Sims, Author Of 'The Story Of Charlotte's Web' E.B. White's classic children's book is ostensibly about a spider and a pig. But author Michael Sims says the story is really about the barn the critters live in, based on a real barn on White's Maine farm. Courtesy of Walker & Co.
E.B. 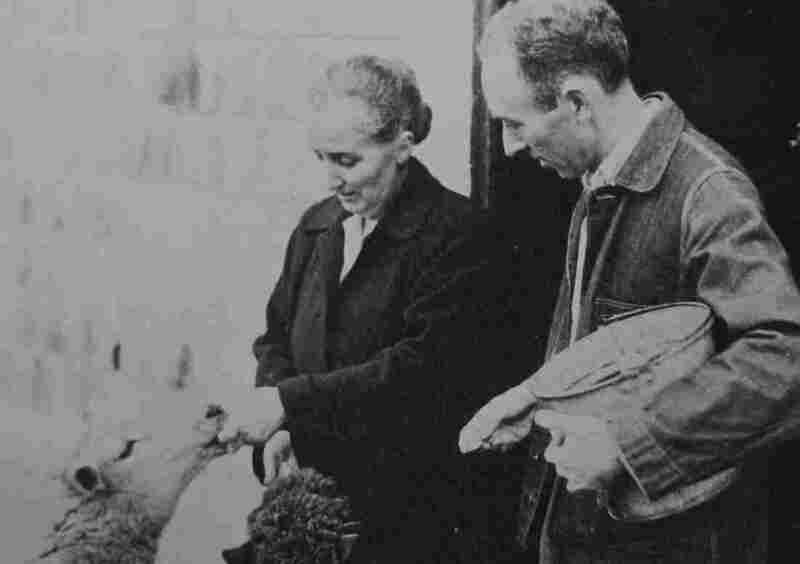 White and his wife, Katharine Angell, feed sheep on their Maine farm. Sixty years ago, the book Charlotte's Web first appeared in print. This children's classic is often seen as a story of a spider and a pig. But when E.B. White recorded a narration of the book, he said something different: "This is a story of the barn. I wrote it for children, and to amuse myself." And the way he describes it, Homer Zuckerman's barn is a character with its own, complex personality — smelling of hay and manure, of grain and axle grease and new boots and fish heads for the barn cats, but mostly hay, which was a familiar smell to White. He grew up in a New York City suburb at a time when people rode horses and carriages, and his parents had a stable. "His favorite thing was to care for animals," says author Michael Sims. "Chickens, ducks, mice, dogs of course." 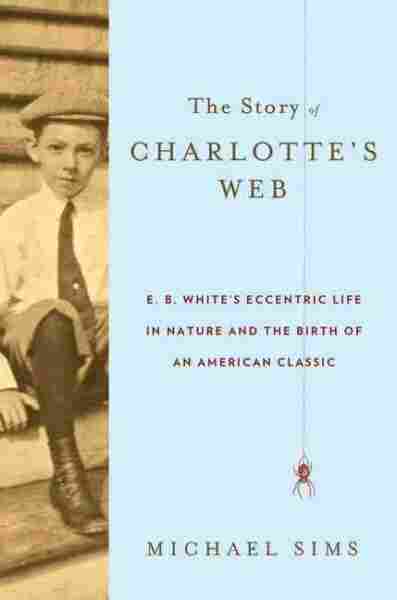 Sims is the author of The Story of Charlotte's Web: E.B. White's Eccentric Life in Nature and the Birth of an American Classic. "In 1933, [White] and his wife, Katharine Angell, moved to Maine, bought a farm and settled into a whole different kind of life that brought back all of the favorite joys of childhood," Sims says. And it was White's experiences in his own barn that led him to the story of Charlotte and her web. "One of the pigs he was raising died," Sims says, "and while he was carrying the pails of slops every day to the replacement pig in the barn, he noticed there was a spider attending its web every day, expanding the web, rebuilding what had happened the night before, and then one day he saw that it had spun an egg case." When White had to go back to New York City, he cut down the spider's egg case and took it with him. Eventually the baby spiders hatched, and after that, White finished spinning his now-famous tale. And in 1970, he sat down in a studio to record the narration.